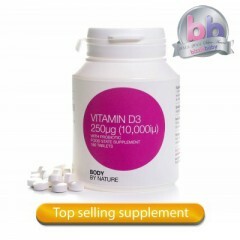 Vitamin D3 – Vitamin D is a fat-soluble nutrient and is one of the 24 micronutrients critical to human survival. It is found naturally in fish and eggs and is added to dairy products, but the sun is the major natural source of the nutrient. Body by nature’s pure, clean tablets give you a far better form of D3 without the rubbish, and are supplied to you in a foodstate. No bulkers or fillers in our supplements.